There is absolutely no doubt that children love little things!! Knick-knacks, miniature items, collections of teeny tiny diddly bobs! It’s also true that children love pirates. With this in mind, what better idea could exist for a children’s book that tales of adventurous pocket sized pirates (smaller than a tea cup). Of course who could be more suitable to take on this subject than the awesome pen wielding buccaneer himself Captain Chris Mould! 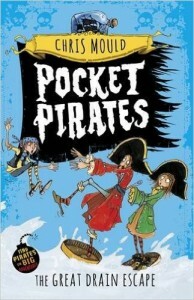 Pocket Pirates, the Great Cheese Robbery follows the adventures of tiny pirates Button, Lily, Captain Crabsticks and Old Uncle Noggin. They all reside happily in the old junk shop, inside the ship in a bottle – how ingenious is that? Every pirate ship must have a ship’s cat to bring good fortune to each journey and these tiny swashbucklers are no exception. The pocket pirate ship may not be sailing far right now, but Jones, the ship cat, is still a cherished member of their team. 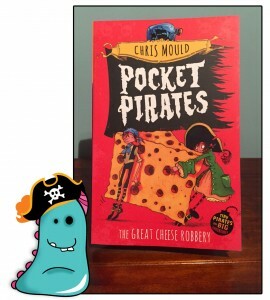 When the cheeky Skirting Board Mice kidnap poor Jones, leaving a ransom note demanding a huge hunk of cheese in exchange for him, the pirate crew must set out on a daring and dangerous mission. They must travel across the huge junk shop, to a place never ventured before … the cold icy land of FRIDGE! With many obstacles to face in this enormous world, including a giant drooling and very hungry dog, the pirate adventurers have a tough challenge ahead. I personally was particularly fond of that dog even if the pirates weren’t!! The Great Cheese Robbery is a rollicking great adventure from start to finish. Peppered throughout with Chris Mould’s stunningly detailed ink drawings. You can’t helped but get sucked into this giant tale of miniature proportions! 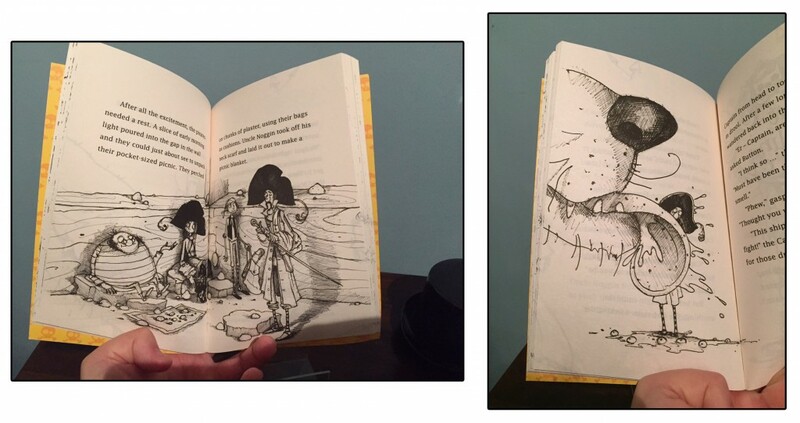 The initial illustrated introduction to the main characters is brilliant and gives children an instant visual feel for the personalities in the story. 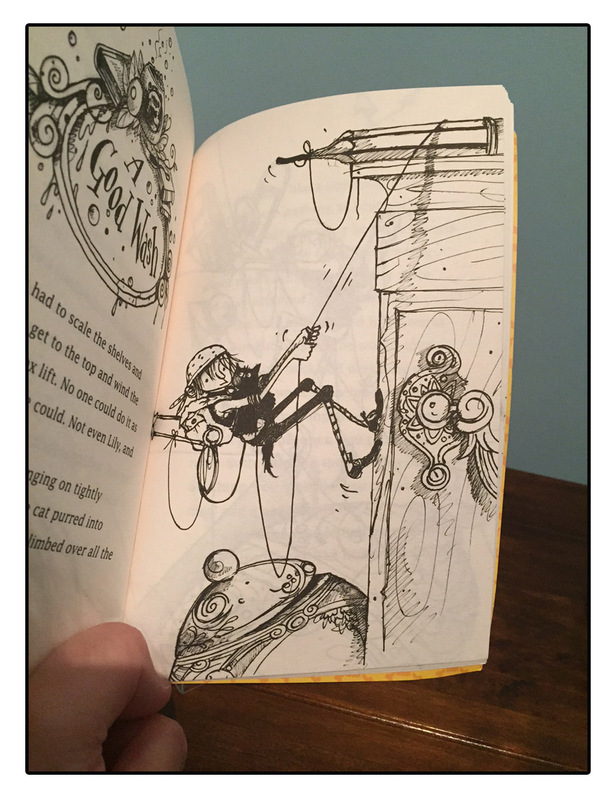 On the final pages is a drawing of the junk shop home and this is truly a wonderfully detailed illustration which can be enjoyed for ages and really helps to give a sense of scale to the journey of the pocket pirates. All of these illustrations and small bursts of text ensure the book is accessible to readers of varying abilities. It’s a fairly quick read yet there is no let up on the high quality of the storytelling. It’s great for reading out loud too. There are tons of funny moments to keep readers of all ages entertained, including Old Uncle Noggin’s half-finished stories … I think we all probably know an Uncle Noggin. I also particularly enjoyed the neat little addition of the Ancient Greek Troy horse story which could be expanded upon, for any interested children, giving this story even more life beyond the last page! This is clearly going to be a great series of books that will fly off bookshop and library shelves, and deservedly so. Pocket Pirates 2: The Great Drain Escape is due for release on February 11th 2016. Haaarrrr!! Thanks for sinking your teeth into this Book Monster Review.